Ms. Gorton received her Bachelor of Science degree in aeronautics and astronautics in 1984, but while a NASA job remained appealing at graduation, the agency was not hiring. A hopeful resume mailed to Langley Research Center nevertheless drew attention at the Army’s co-located laboratory, now part of the Aeroflightdyanmics Directorate. “That was very fortunate for me, so I packed up everything and moved down to Virginia,” explains Ms. Gorton. At Langley, the new Army engineer joined a team exploring loss of tail rotor effectiveness on the OH-58D Kiowa Warrior helicopter. The team built a 21% main and tail rotor model for tests in Langley’s 30 by 60 ft wind tunnel. Researchers simultaneously looked at new rotor analysis tools and experimental methods. “The Army also put me back into graduate school part-time, so I was pretty busy right there the first couple of years.” Ms. Gorton subsequently earned a Master of Science degree in aeronautics from George Washington University. First flight of the YRAH-66 the following year nevertheless uncovered vibration issues, and Langley researchers were again at work. “We called it a 9-1-1 response to problems they were having in flight test,” says Ms. Gorton. “We looked for the source of the problem and for some quick fixes they could apply to the flight test.” Working with Boeing and Sikorsky, the changes were incorporated, and Ms. Gorton received the Army Civilian Service Medal for her contributions to Comanche development. After 15 years with the Army, a NASA initiative provided Susan Gorton a fixed-wing research opportunity. 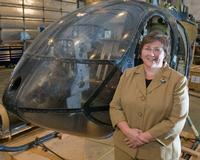 “I really left rotorcraft in 1999 and worked on active flow control research,” she explains. NASA partnered with Boeing, the Defense Advanced Research Projects Agency (DARPA), and the Air Force Research Laboratory on adaptive flow control vehicle integrated technology for a tilt-wing Advanced Theater Transport. Ms. Gorton did more research on inlet flow control and became head of the Flow Control Branch in 2005. NASA researchers are also sponsoring university work and seeking industry and international partnerships in active rotor mechanisms and actuators. Ms. Gorton explains, “The active rotor systems, I think, are really the way of the future – a way to optimize rotor efficiency with a degree of freedom that goes well beyond a passive design.” NASA, DARPA, Army and Boeing researchers teamed on an active Smart Rotor in the National Full Scale Aerodynamics Complex (NFAC) at Ames Research Center last spring, and NASA, the Army, Sikorsky and ZFL are working on an upcoming test of Individual Blade Control. Another SRW partnership with the Army will test an active twist rotor in the Langley Transonic Dynamics Tunnel in the fall of 2009.